Add the 2oz to 2 gallons of water. Let your mask soak for 10 minutes. Lightly scrub as needed. Will NOT harm rubber. Rinse completely with clean water when finished. 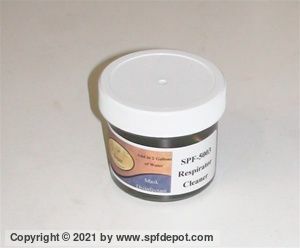 Great product to use at home on counter tops, bathtubs, shower floors, litter box... 2oz makes 2 gallons. Clean counter top, apply a mist and let stand for 10 minutes. Rinse with clean water and dry with a clean towel.